A South African gold mine manager discovers a plot hatched by the mine owners and London bankers to flood the mine in order to curb gold production and consequently manipulate its price on the stock markets. Harold Pelham encounters a duplicate of himself in the aftermath of a car crash. After that moment, his life is upset. During World War I, a British aristocrat, an American entrepreneur, and the latter's attractive young daughter, set out to destroy a German battlecruiser, which is awaiting repairs in an inlet just off Zanzibar. During World War II, the British must attack a German ship, but it's safe in neutral Goa. As a result, they send civilians: former soldiers who are about sixty years old. A Chicago psychoanalyst's patient and secretary are murdered and he becomes the police's prime suspect despite his claims that someone is trying to frame him. Lieutenant General Henry Steedman: In NATO, you have to have unanimous approval from all the member nations. It's like getting a troop of horses to piss at the same time. I guess that the film wasn't so popular but I may be wrong. 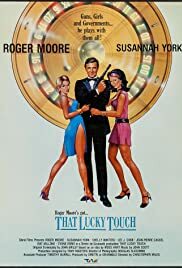 The fact is that many people have dislike to "That Lucky Touch" because it's not an action movie (as many of viewers had thought before watching this) but very light and "likeable" romantic comedy featuring Roger Moore, Susannah York, Shelley Winters and Lee J. Cobb. Anyway, I suggest you watch "That Lucky Touch" and that's not only because of a fantastic performance given by Lee J. Cobb, and real good-looking pair Moore-York (they both had played together before in Peter Hunt's "Gold" (1974)) but also because it's a good "lonely-Friday-night" movie and Christopher Miles' gentle direction will make you feel relaxed.